Andover dining room designed by Ana Donohue. 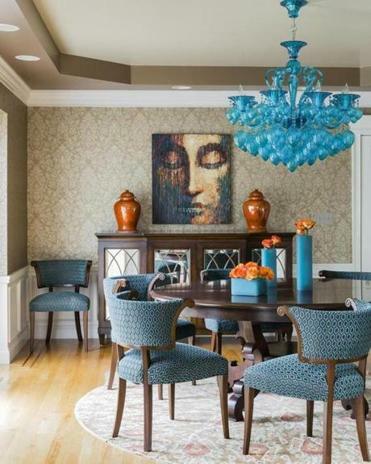 A neutral backdrop was already in place when Boston interior designer Ana Donohue was called in to furnish and accessorize this Andover dining room. To enliven the space, Donohue capitalized on the homeowner’s affinity for jewel tones. “We used aqua and tangerine to make the space pop,” says Donohue, who notes that the bursts of color do not detract from the room’s predominantly traditional feel. Donohue made a large-scale painting depicting the outline of a face by artist Virginia Peck a focal point. “In dining rooms, I like to play with art. Find something that creates interest and let it play the opposite: This piece is unexpected in a very traditional dining room,” she says. Another bold choice is the aqua blown glass chandelier from Horchow. 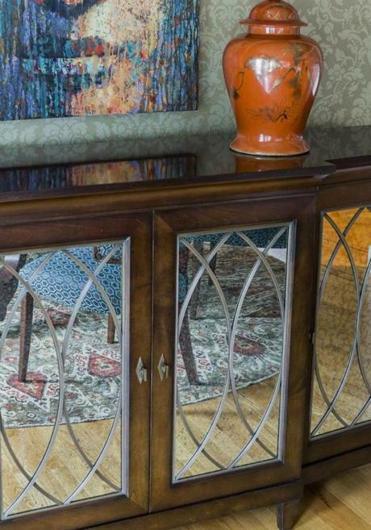 Various patterns provide a multidimensional feel. The damask, tone-on-tone wallpaper is free flowing with lots of curves; the wool Landry & Arcari rug has a colorful interconnecting pattern; and the chairs are upholstered in a Duralee fabric with a smaller print but a bolder hue. Century buffet has mirrored door fronts that break up the wood in the room. Find comfortable chairs: Nothing is worse than an uncomfortable dining chair. “If you go the effort of designing the room, and you want to entertain, it’s essential to find chairs you’ll want to sit in for more than an hour,” says Donohue. Try out the chairs before buying and seek one that hugs you and allows you to put your arms up like these English Regency style chairs that have upholstered seats and backs. Consider what you have underfoot: A rug under the table completes the décor, but one ill-fated food or drink spill can ruin the entire scheme. Stay away from solid or two-tone rugs and avoid silk. Natural fiber rugs like jute are pretty durable and easy to clean. Wool rugs like the one in this room will clean up easily with soap and water if you address the stain quickly. “If you are really worried about spills, select a rug with multicolors and lots of patterns, that way stains will blend in,” says Donohue.